FILE - Mexico's Foreign Minister Luis Videgaray delivers a speech during a meeting with diplomatic corps in Mexico City, Mexico, Jan. 9, 2017. Mexico's top diplomat Luis Videgaray said on Tuesday that Venezuela is no longer a functioning democracy, one day before foreign ministers from across the Americas are due to meet to discuss the crisis gripping the South American country. The comments mark one of the most aggressive critiques of the government of Venezuela's socialist President Nicolas Maduro to date from Videgaray, the former finance minister and close confidant of President Enrique Pena Nieto. "We have to call things by their name, and what we have here is a country that, in fact, has ceased to be a functional democracy and this is a tremendously dangerous thing for the region," Videgaray said at the Americas Conference Series in Miami, Florida. 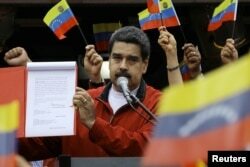 FILE - Venezuela's President Nicolas Maduro shows a document with the details of a "constituent assembly" to reform the constitution during a rally at Miraflores Palace in Caracas, Venezuela, May 23, 2017. The conference was organized by the Miami Herald and El Nuevo Herald news organizations as a forum of international business and government leaders. Videgaray has been sharply criticized by Maduro's government but has nonetheless pledged to use all diplomatic channels to help reach a peaceful political solution to the bloody crisis in Venezuela. 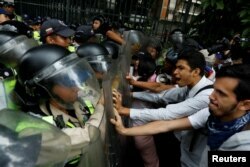 Anti-government protests have intensified in Venezuela for two months and left nearly 60 people dead. The country is in a steep recession, with widespread shortages of food and medicine and skyrocketing inflation. Maduro has said the protests are a violent effort to overthrow his government, and insists that the country is the victim of an "economic war" supported by Washington. FILE - Opposition supporters confront riot security forces while rallying against President Nicolas Maduro in Caracas, Venezuela, May 12, 2017. Asked at the forum if Venezuela is governed by a dictatorship, Videgaray said, "Well, I believe that, today, it is not a democracy and we are frankly seeing authoritarian actions," citing as an example the use of military tribunals to try civilians. He said the solution to "re-establish democracy" in the South American OPEC nation is in the hands of the Venezuelan people and the Maduro government. Videgaray said he hoped that a Wednesday meeting in Washington, D.C., of foreign ministers from members of the Organization of American States could yield a resolution calling for elections in Venezuela, a restoration of the national assembly's powers, and release of political prisoners.